Measuring instrument of stainless steel mounted to diaphragm seal with wikaramic coating. 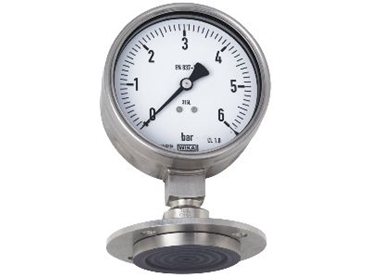 IN process industries, a wide variety of processes can be monitored using pressure gauges and pressure transmitters. However, when the media to be measured are abrasive, these measuring instruments can wear out extremely fast and have to be replaced at short intervals, meaning high costs in terms of maintenance and replacement parts. For example, slurries, sandy or powdery process media and mixtures containing solids act on the measuring instruments like emery paper, abrading their connections or destroying their sensitive diaphragms. Wika now offers pressure measuring instruments mounted in combination with diaphragm seals that are coated with wikaramic in order to resist the abrasion. The flush diaphragm seals, with wikaramic coating, have a high abrasion resistance and thus protect the sensitive diaphragm from scouring and prevent them being worn down quickly. The seal's wikaramic-coated diaphragm resists the abrasive action of the pressure media as it passes, and so is not destroyed. The process pressure is transmitted to a hydraulic fluid via the flexible diaphragm, and from there to the sensor itself or the mechanical pressure gauge. In this way, the pressure can be reliably measured, even with abrasive, powdery media or mixtures containing solids.